Stampin' Up! has been a great experience for me, teaching a craft I really enjoy doing... Meeting some great ladies who also enjoy paper crafting. Stampin' Up! provides me the means to share my joy of crafting with you. Let me show you how you could be part of this fun!! "This is my personal Stamping/paper crafting blog, I am an Independent Stampin' Up! Demonstrator, and I am responsible for its content. Stampin' Up! Does not endorse the use of or contents of the classes, services, or non-Stampin' Up! Products I may use/offer here on my site. Wow; I am so stinkin' excited about the Stampin' Up! and Becky Higgins, Project Life announcement. Here is "the rest of the story". 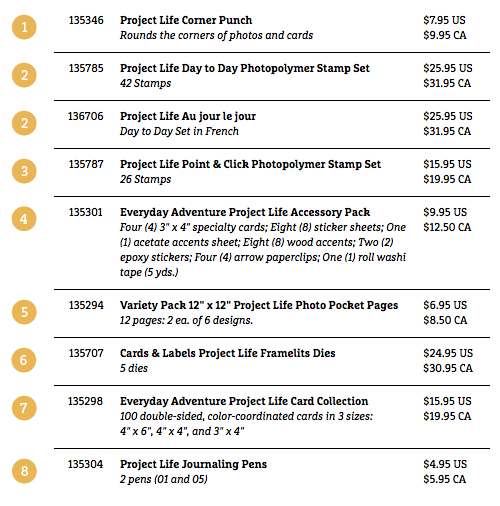 If you are unfamiliar with the Becky Higgins, Project Life products, it is a "pocket style" scrapbooking system with coordinating cards for journalling and embellishing your photo pages. Now Stampin' Up! 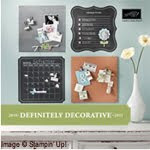 will be partnering with Project Life to offer exclusive kits that will coordinate with Stampin' Up! products. All the coordinating products are one of the biggest reasons I enjoy Stampin' Up! so much. It makes everything super easy! There will be punches, stamps, notecards, washi tape, storage boxes.... everything you need to make scrapbooking quick and easy! I am so excited about this. I have not scrapbooked in a very long time because it was just overwhelming to me. I had too many paper choices and photos and embellishments and stamps..... It simply was not something I could efficiently do, so I stopped doing it. With these products, I can see I will easily be able to enjoy scrapbooking again. Imagine packing for a weekend crop and only needing to take one box of photos, one box of supplies and a scrapbook. You can certainly color me happy right now, my friend! AND as a Stampin' Up! Demonstrator, I get to order my products early, and save 20%. I can hardly wait for April 21st, when I will be able to order a limited number of supplies (as shown above). You can coordinate the numbers in the circles with the above photo to see what each item is. These items will be available for customers to order on May 1st, AND there will be a full line of Project Life products available in the all-new 2014-2015 Stampin' Up! 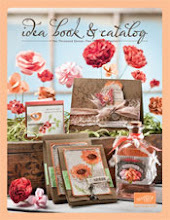 Annual Catalog. ORDER PROJECT LIFE EARLY AND ENJOY STAMPIN' UP! DISCOUNTS, RESOURCES AND FUN! Become a member of my Stampin' Team by purchasing the Stampin' Up! 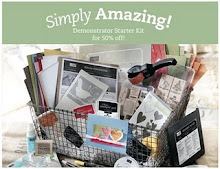 $99 Starter Kit with me HERE, and be one of the first to enjoy our new partnership with Becky Higgins & Project Life. As a part of Stampin' Up!, you'll be able to pre-order Stampin' Up! 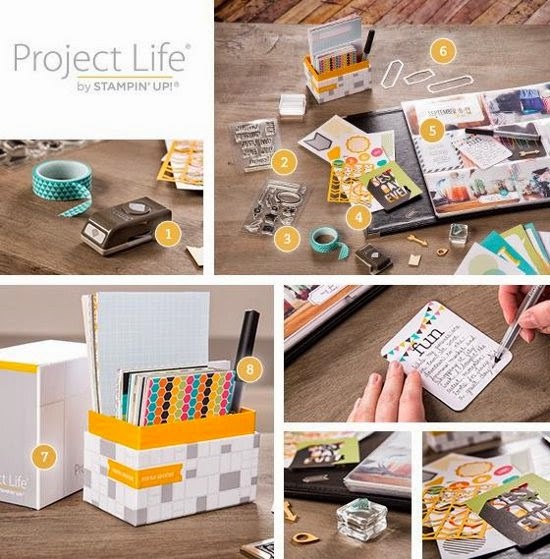 Project Life products starting Monday, April 21, and get discounts on available Project Life and other Stampin' Up! products while you remain a member. At a minimum, you'll enjoy discounts and benefits through October 31, 2014. This is an awesome way to try it out, and have some fun, all risk-free with no further purchase required! Join now and your Stampin' Up! Convention registration (Salt Lake City, UT, July 17 - 19) is FREE (a $295 value). This offer is only available until convention attendance is full. The Stampin' Up! Holiday Sale starts Wednesday, November 20th and ends December 2nd. AND Doorbusters will be available on Wednesday only. This sales is huge! You can save up to 50% off tons of products. Use the link below to view the Holiday Sale items, and make your list. You can begin ordering first thing on Wednesday. You can order sale items along with weekly deal items and regular-priced items too. This is an awesome opportunity to pick up gifts for each and every paper crafter on your list. With all those savings, you can afford to treat yourself to a little something too. These are only available while supplies last so take advantage of this offer-just in time to create 10 heirloom ornaments! But get your orders in early so you have plenty of time to make them for Christmas gifting-or for your family tree! Like it or not, Christmas is just around the corner (hopefully you're in the "like it" camp). Either way, you'll want our brand-new Endless Wishes Photopolymer Stamp Set so you're prepped with festive greetings for all the little gifts, tags, and holiday projects you'll make this season! Stampin' Up! has reached a milestone--250 posts on their customer blog--and they want to celebrate with us! Beginning tomorrow (October 3), they will begin a series of Thank You Thursdays posts, where SU will offer discounted products for one day only (while supplies last)! Visit the blog each Thursday in October to see the new deal. And thank you for helping to make our blog an inspiring place to be! Big Shot from Stampin' Up!